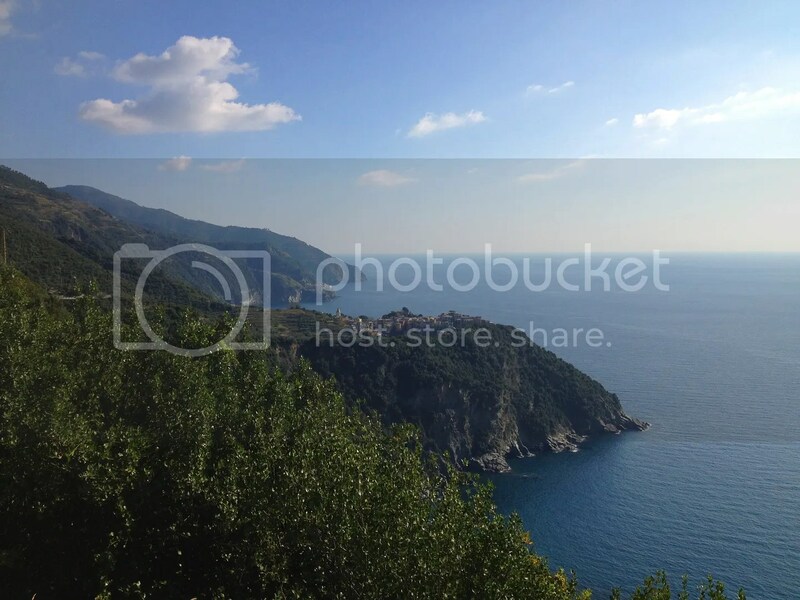 October 2014: The Cinque Terre | A party of one. The five villages of Riomaggiore, Manarola, Corniglia, Vernazza, and Monterosso comprise the Cinque Terre, from south to north. Each is impossibly built into the craggy coastline where the top of the boot curves west toward the south of France. The region is both a national park and a Unesco World Heritage site, and because vehicle access is either limited or nonexistent, most visitors access the area and move between villages by train, ferry, or walking trail. After researching the five villages, I told my husband I thought we should stay in Manarola, the smallest. 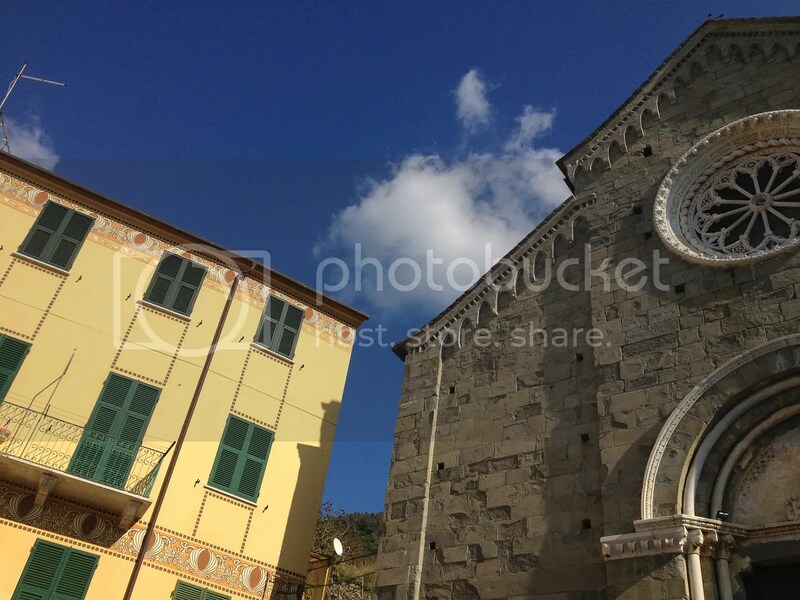 Riomaggiore and Monterosso get a lot of tourism from Pisa and Genoa to the south and north, respectively, and Monterosso is the largest. 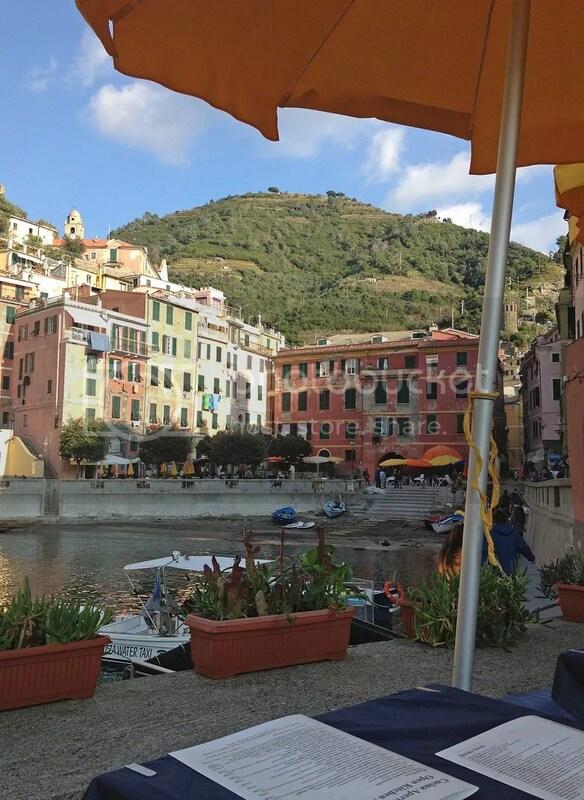 Vernazza is supposedly even more overrun by tourists, especially Americans with Rick Steves guides — Steves is vocal about it being his favorite of the five villages. 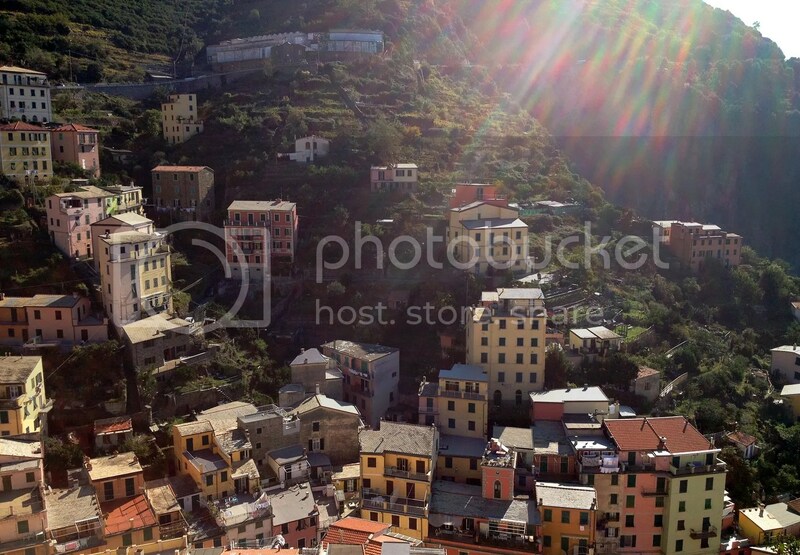 And staying in Corniglia would mean carrying our heavy suitcases up almost 400 stairs. I wisely guessed that would be hard enough without suitcases. I thought quiet, modest, and hopefully overlooked Manarola seemed perfect for us, and my husband trusted me. Though I did most of the research going into the trip, he did all of the actual bookings for us, and he really struggled to choose the best place for us in Manarola. He wanted it to be a surprise, and I trusted him. 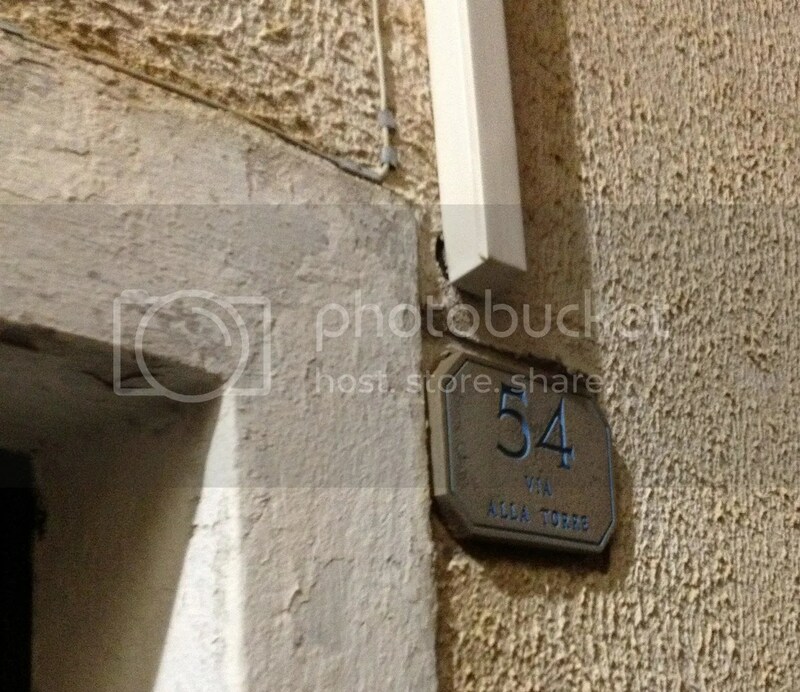 It’s so easy to get lost in Manarola that we took a picture of our address and other markers to help us find our way between the village and apartment the first couple of times. I had every reason to. We followed our rental manager’s boyfriend up a hill, our suitcases rumbling over the uneven stone path, then zig-zagged up and down several steep staircases between the closely packed, terraced houses. At around the third turn, my husband wisely suggested that we note distinctive features like brightly painted shutters or potted plants so that we’d be able to retrace our steps later. Finally, we came down our last set of stairs and rounded the last corner and unlocked the door of our apartment to find — inevitably — a staircase. Once upstairs, I gasped and threw my arms around my husband. 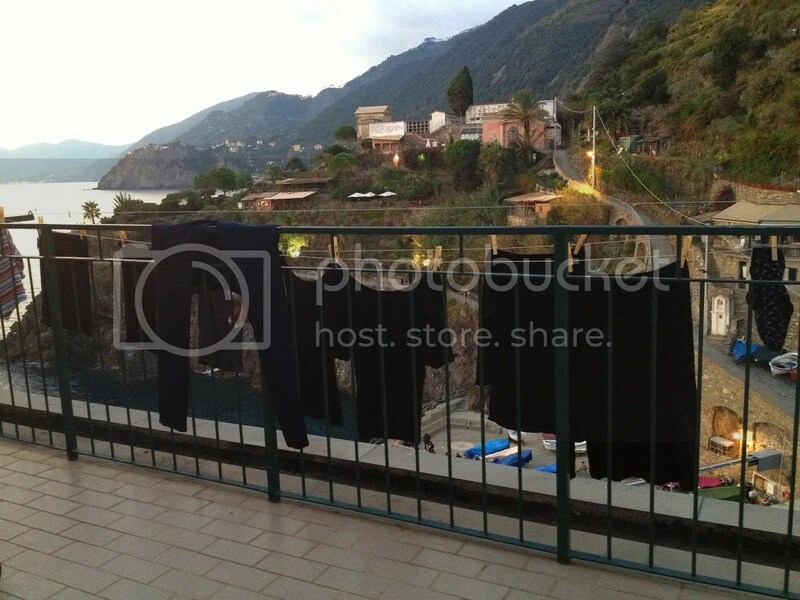 Our large, modern rental in Manarola would be my favorite of the trip. We had purchased wine in the village before our ascent, so we cracked open a bottle, poured ourselves glasses, and collapsed into the modern, low-slung lounge furniture on our deck, overlooking the entire village and the Mediterranean Sea. Looking around, I thought our cliffside dwelling seemed so precarious and foreboding. It would make far more sense for the cliff to be turned on its side and the structures built up from it rather than out. But the ancientness of the structures, with the countless sheets and blouses blowing in the wind on clothes lines showing signs of life, reminded me that I was safe. Our apartment was equipped with a tiny washing machine and clothesline and clothespins, and soon, my shirts and jeans were just part of the landscape. My clean clothes for the second half of the trip, on the most scenic clothesline in the world. 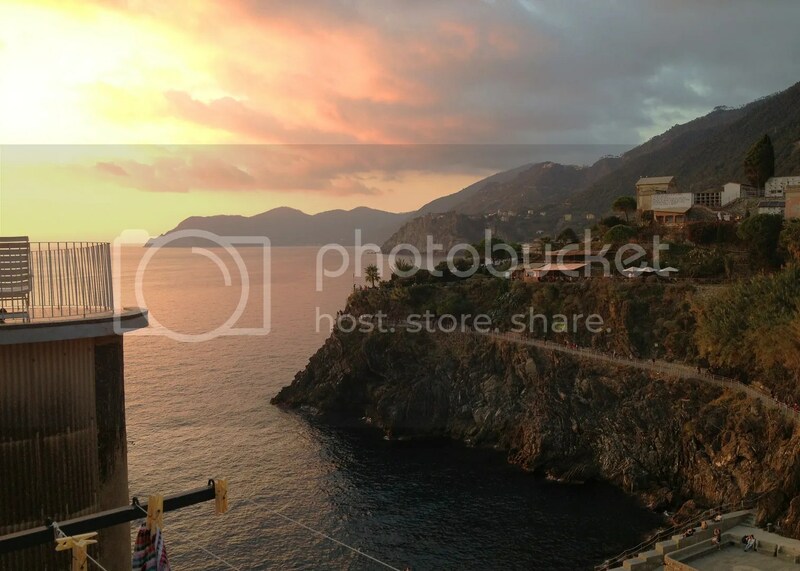 A short sunset walk around the village helped build our appetites for dinner at Trattoria Dal Billy, Manarola’s top rated restaurant on TripAdvisor. The restaurant is about as high as the cliffside homes go, so the walk there seems to justify whatever follows. Given the choice between two dining rooms, set on either side of the pathway, we probably made the odd choice. The other looked the part of a coastal trattoria, brightly lit with colorful table linens, and it even had a better view out over the water. But the sun had long ago set, and the views in the other room, dark and cave-like, had their own appeal. My husband could see out to the ocean past the small, dimly lit room with its sparse decorations and modern farmhouse style tables, while I looked at the vertical rock face of the cliff behind a wall of glass. I told my husband I was giving him “the view,” but I really liked mine, too. With my specific fear of falling off a mountain, I at times felt tense taking in the steepness of it, with the knowledge that whatever was holding the restaurant up wasn’t the ground. 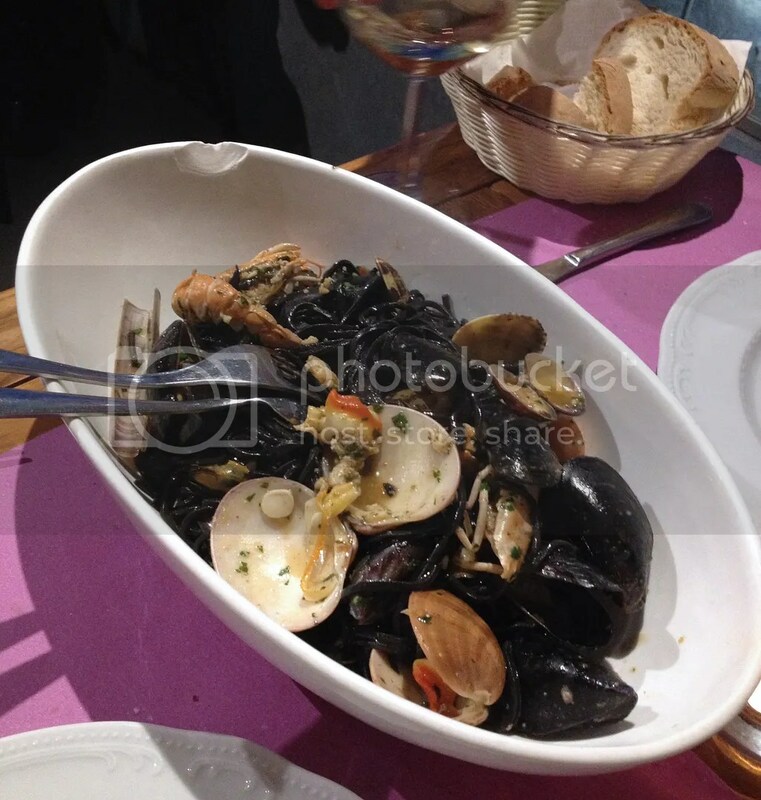 Seafood pasta at Trattoria Dal Billy in Manarola. Our server was without time or place. He could have been a boyish 60 or an experienced 40, and I was almost startled when he first spoke, having taken him for an expat. He wore a well-loved white T-shirt and faded shorts, and he was thin and tanned, his sandy hair a little wild. He seemed funny and garrulous and mischievous, and men from the village stopped in throughout the night to see him. Ben Mendelsohn’s Danny Trayburn on the Netflix series Bloodline completely reminded me of him, if not for our server speaking English only to reply to me that he was “not Billy” and the local fish was “very good.” If anyone else had been waiting tables or running or bussing food, I don’t remember them. 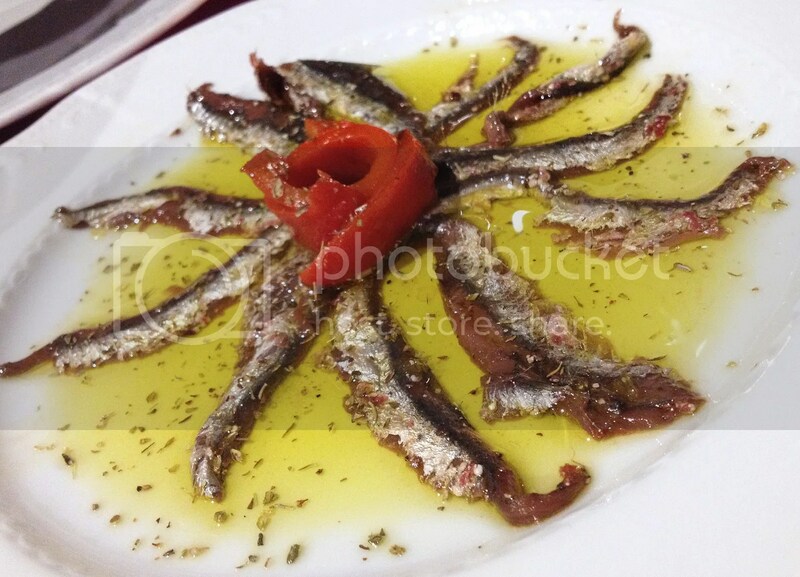 We enjoyed salted anchovies bathed in olive oil with red bell peppers, and sea bream reeled in fresh that morning and grilled whole. But my favorite dish, and one of my favorites of the trip, was their cuttlefish ink pasta with fresh seafood, minimum 2 diners to order. The plate was enormous, filled with razor clams, mussels, langoustines, shrimp, and small clams, and we ate all of it. It was simple and sublime. Until that night, we had yet to take advantage of the Italian restaurants’ apathy toward diner turnover and leniency in regard to closing times. Having worked in a number of restaurants, I can honestly say that I have never cared about how long a group has lingered at its table, but I have privately wished ill upon the last diners in a restaurant who order dessert or another round of drinks. I thought certainly, the Italians must want to clock out, too. And I would later find out that some do. But not our server. By the end of our meal, a large, boisterous group had left, and maybe one or two other couples were about to. My husband and I had had a good amount of wine with our meals — and before it — and we were leisurely finishing our glasses when “not Billy” retrieved a cart from the large table with three large, mostly unmarked glass bottles: limoncello, grappa, and a dried fruit liqueur that I’d never heard of and didn’t recognize when he drew a sketch of it. He said “help yourself” then disappeared to the other dining room. And suddenly, we were alone, hanging off a cliff, with no end in sight. Trattoria Dal Billy was my favorite restaurant of the trip. Needless to say, “Not Billy” introduced us to Italian hospitality, and we introduced him to American tipping. I was really hungover the next morning, and it didn’t help that I was still jet lagged and waking up no later than 5:30 a.m. 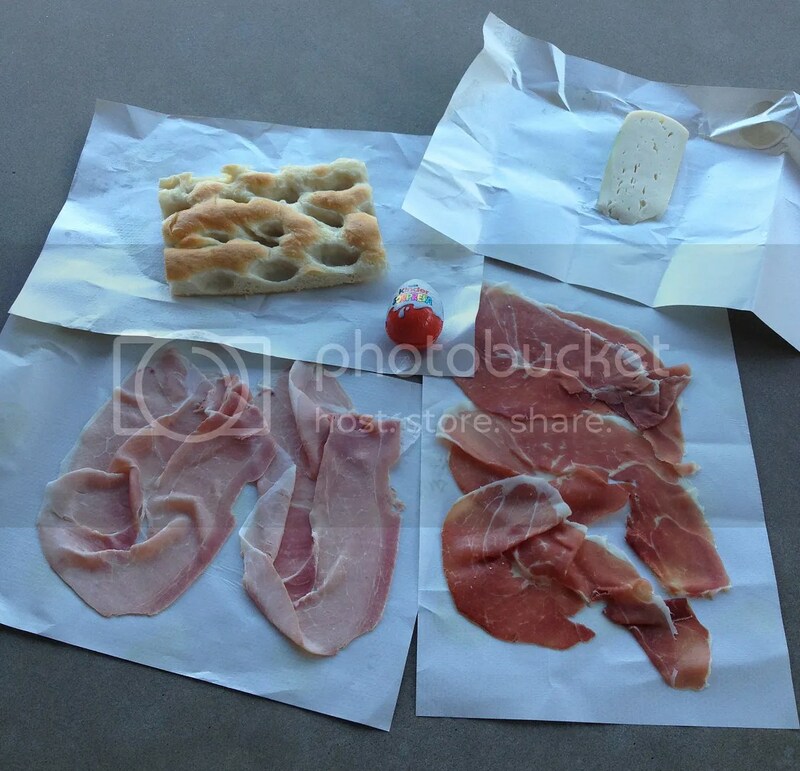 I walked down to the village to purchase fresh focaccia, cheese, and prosciutto from the village’s one grocery store for us. 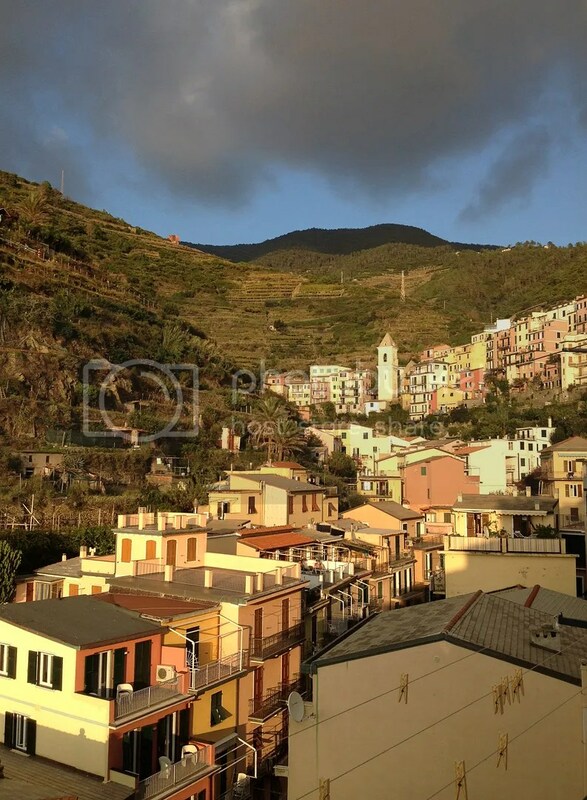 My husband had hoped that we would hike between Riomaggiore and Vernazza, the southernmost and second-to-northernmost villages, but the two southernmost trails were closed at the time of our visit, to my relief and disappointment. I was glad not to spend the entire day hiking, but disappointed because the closed pathways would have been the easiest. 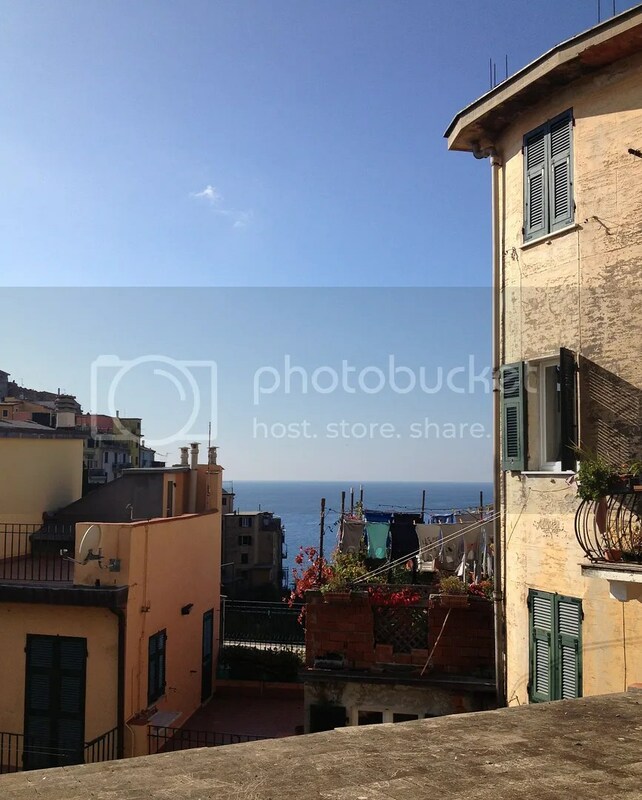 The first is even called Via dell’Amore, loosely, “Lovers’ Way,” for the ease and views it lends to romantic strolls. Our best and really our only option was the 2.5 mile trail between Corniglia and Vernazza — punishingly steep regardless of which direction you go with few coastal panoramas, and by starting in Corniglia, we would climb almost 400 stairs before even starting the trail. My husband at the Castle of Riomaggiore. We bought train day passes and visited Riomaggiore first, just to see it. 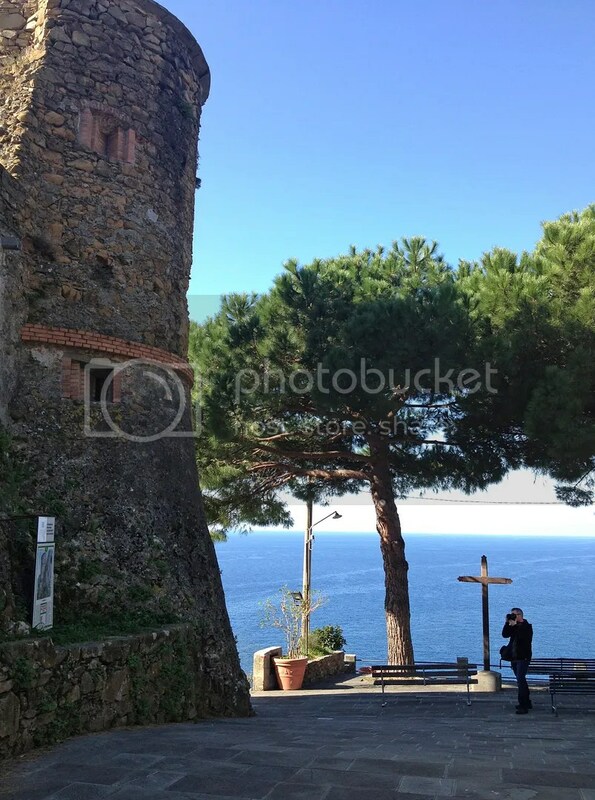 We hiked up a steep, winding path to the Castle of Riomaggiore and Oratory of San Rocco at one of the highest parts of the village. My hangover made this wildly unfun. “I’m just going to be over here, sitting,” I called out to my husband when I felt I’d sufficiently taken in both, lowering myself to a little patch of concrete while he excitedly took pictures of the castle’s scenic clock tower and the village below. I wanted to be as energetic and explorative as he was, but my hangover was like a 14th century Italian church: built to last. Looking out from the Oratory of San Rocco. The return trip downhill to the train station, an enormous bottle of water, and a short train ride to Corniglia all provided some relief. But the only thing that could outmuscle my hangover was something far harsher on the body than a small army’s worth of cordials. Corniglia’s almost 400 stairs are built against a steep slope so that you traverse back and forth sideways and slowly make your way up. They’re oddly spaced from one to the next, rarely shaded, and perfectly suited to induce vertigo. And they seem so excessive — we waited in a long line to climb Florence’s Campanile and were rewarded with spectacular views of the Duomo and the city, and bragging rights, whereas Corniglia’s stairs are just a starting point, and mostly unheard-of, worthy of blank stares at best. But with every step, my body wrung out the alcohol, and when I reached the top, it had been worth the trouble. Hangover, finito. 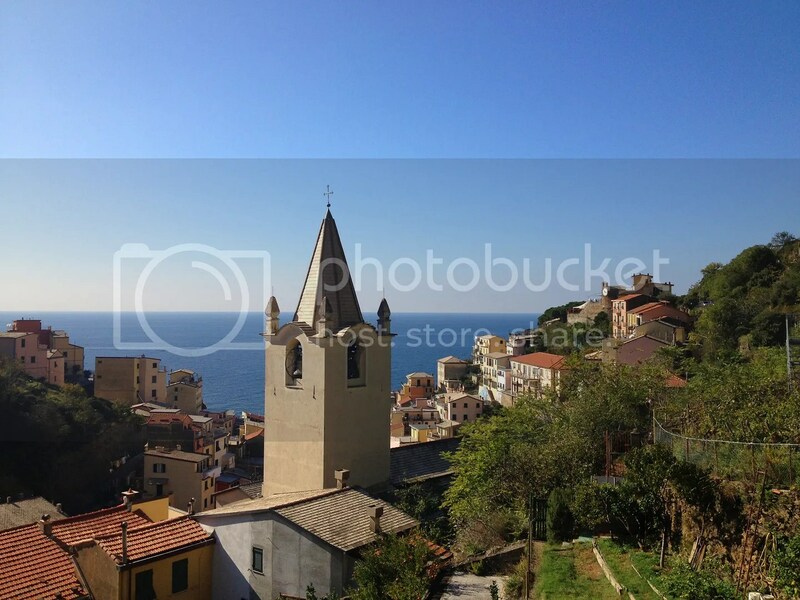 Corniglia is very pretty, but it does not exude warmth. Almost no one was out and about, and signs in front of restaurants warned of service charges and no restrooms. (We were so dehydrated, they needed not worry.) We felt content not to linger, but we had a lot of trouble finding the trailhead, which, given that tourists must pay to access it, you would think would be sufficiently marked. 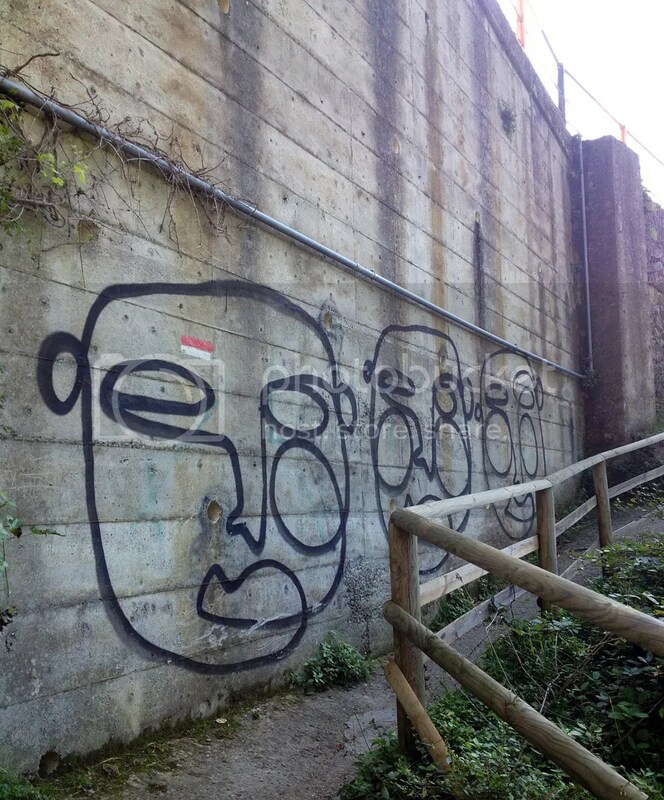 Street art at the Corniglia trailhead. The trail did not disappoint, in that it met my expectations of being challenging with few photo ops of the coastline. But it was mostly shaded by trees and not consistently steep, and we stopped for pictures when we needed breaks. One of the few good views on the trail. We never had a sense of how far along we were because a long ascent tired us out early on, and numbered markers that had seemed to mark distance became implausible, but we could tell when we were finally approaching Vernazza. First, our trail turned downhill and stayed downhill, then the vista opened up, and finally, we saw our first hilltop cafe. “Wine?” one of us pitched. I can’t remember who, and it doesn’t matter — the other was thinking the same thing. Approaching Vernazza from the trail. Vernazza is beautiful. Rick Steves isn’t wrong to love it. Like Manarola, it is built around a beachy inlet, but it’s much bigger, and because of that, there is ample space for al fresco dining around the beach and boat launch. We ate our only pizza in Italy in Vernazza, with pesto, which is indigenous to Liguria. Needless to say, we did not do the return hike, opting for the train instead. We watched the sun set behind the sea at an opening in the buildings up a staircase from our apartment with a foursome of older women knitting together, then cleaned up for dinner. Dinner at Trattoria Dal Billy would have been impossible to best, so we considered returning for our second and last dinner in the Cinque Terre. But after much deliberation — probably too much, as it got later and later — we went instead with Il Porticciolo, a homey trattoria with a boarding house in the village below. We enjoyed lobster ravioli and trofie pasta with pesto, the official regional dish, and a main course of mussels stuffed with ground meat and herbs. The dining room was otherwise empty by our late-ish hour except for a boisterous table of mostly older men. It was impossible not to acknowledge each other in such a small room, especially when they were making so much noise and we reflexively looked to see what was so funny or interesting, but we tried to keep to ourselves. 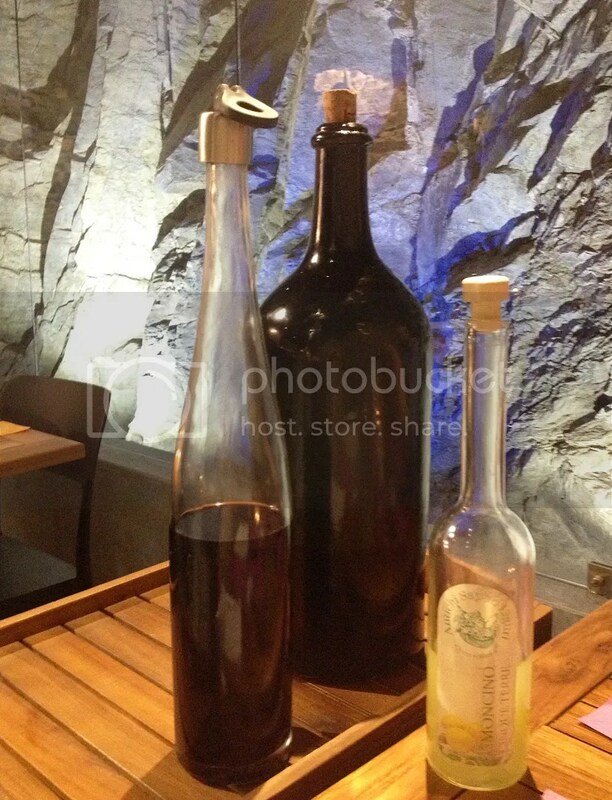 Eventually, our server let on to us that they liked us, because we’d ordered a particular local wine, and the host of the table was the winemaker. Soon, the host himself passed us a platter of pappardelle with local wild boar ragu, with a wink. 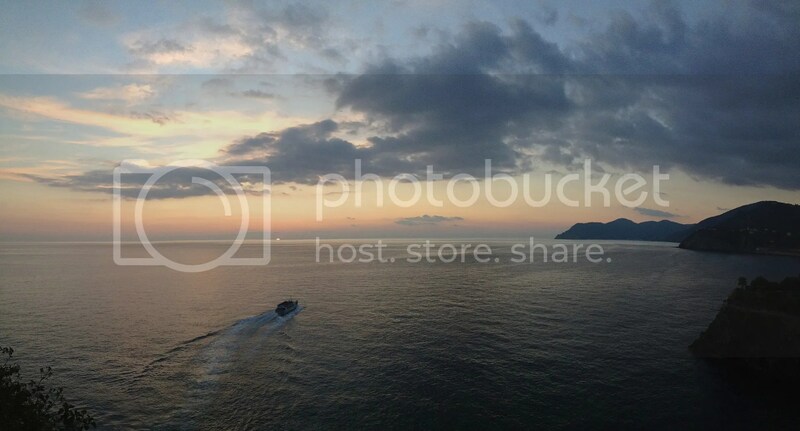 It was such a lucky dinner experience in Manarola, again. My advice? 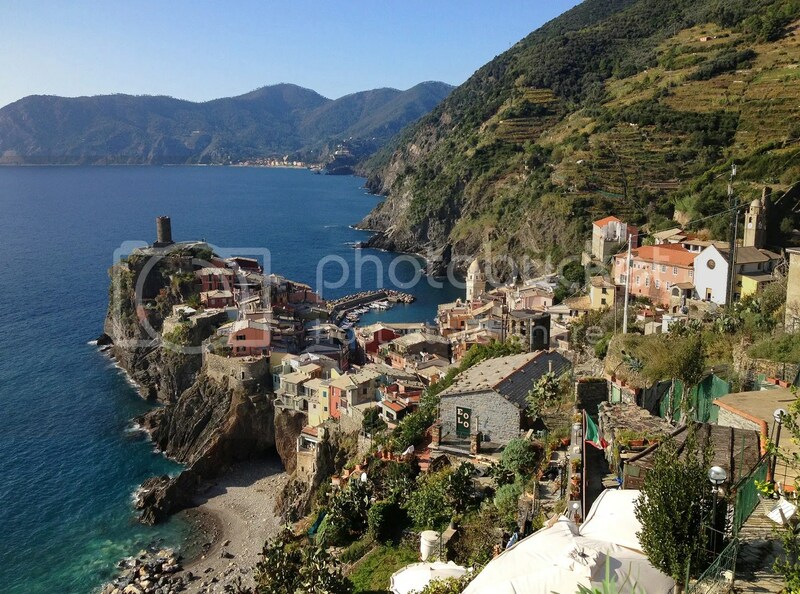 Go to the Cinque Terre and stay in Manarola, or at least eat there.